Juan Cole writes about the lawsuit filed on Wednesday agains the FBI and CIA. Documents requested in a FOIA were never received. (Sound familiar?). Truthout has a story about it here. Thoughts, comments, feedback are always welcome. Wikileaks CIA Release - Say What? Wikileaks offered its first release since the controversial distribution of documents related to the United States effort in Afghanistan. The current leak was posted to their web site on August 25. It is titled CIA Red Cell Memorandum on United States "exporting terrorism", 2 Feb 2010. 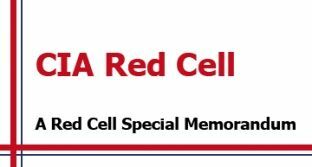 The leak describes Red Cell as a CIA unit created by the Director to develop "out-of-the-box" analysis offering "alternative viewpoints" on key intelligence issues. This document doesn't disappoint in being out-of-the-box. CIA Red Cell starts out by stating, "This report examines the implications of what it would mean for the US to be seen increasingly as an incubator and exporter of terrorism." Don't hold your breath. There's nothing there about the School of the Americas, the shock and awe invasion of Iraq and the carnage that entailed, or 300 dead Panamanians and United States soldiers as a result of the 1981 manhunt for General Manuel Noriega, a former US asset. Read more about Wikileaks CIA Release - Say What? "the Government has determined that continued prosecution of this case as to LINDAUER would not be in the interests of justice." (Jan. 16, Wash. DC) The Department of Justice entered a motion to drop all charges against Susan Lindauer yesterday morning, Jan. 15, 2009. The filing at the federal district court in lower Manhattan ends the government's attempt to prosecute her for allegedly acting as an "unregistered agent" for Iraq. Since her arrest in early 2004, she has repeatedly asked for a trial to present evidence that she had been a United States intelligence asset since the early 1990's. By filing this order, the government surrendered forever its ability to prosecute Lindauer as an "Iraqi foreign agent" and for lesser charges contained in the indictment, including a one week trip to Baghdad in March, 2002. What: Complaint Filed—Vietnam Veterans of America, et al. v. CIA, et al. Some of you might remember a piece from November 17 of 2006 which appeared on the ePluribus Media Journal entitled The Manchurian Veterans by Jeff Huber. If not, you might want to bookmark it to go back for a read. Sometimes, the truth really is stranger than fiction. And for every tinfoil hat conspiracy theory, there may be at least one grain of truth that hides something far worse -- or equally crazy -- as proposed by the tinfoil hat conspiracy theory that further obscures and obfuscates any potential for meaningful investigation and discovery. I have known and served with many military intelligence officers. A handful of them were brilliant. The preponderance of them validated the adage that says military intelligence is to intelligence what military music is to music. I have also known and worked with many Air Force officers, and every one of those bug lovers is dedicated to the Air Force's primary mission, which is to prevaricate its way into possession of the entire defense budget. 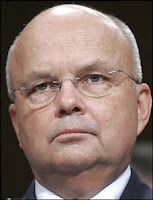 Since CIA director Michael V. Hayden is an Air Force intelligence officer and a Bush appointee to boot, anything he says tends to be standard issue effluvium, and what he's saying now about his agency's right to privacy stinks to high heaven.